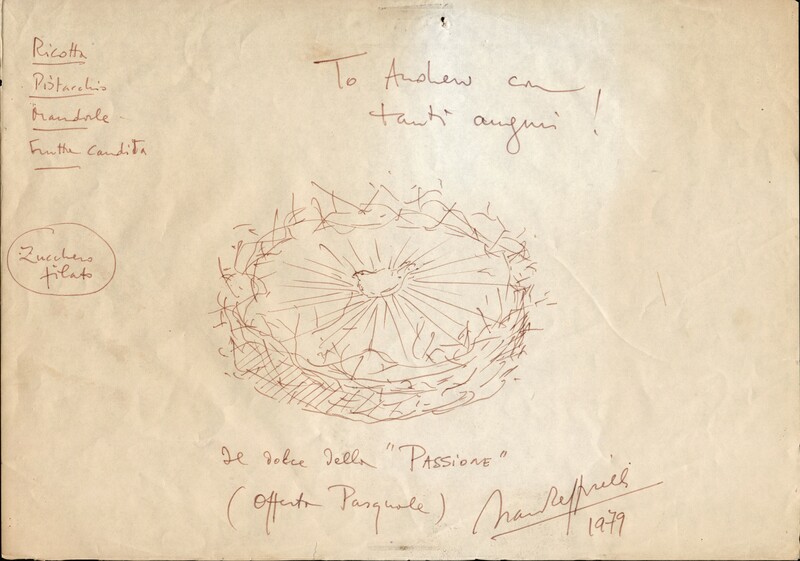 This sketch by the Italian film director Franco Zeffirelli was drawn for Anthony Burgess’s son, Andrew (also known as Paolo Andrea). It appears to be a greeting for Easter 1979, and shows a recipe for a desert called ‘the sweet of “Passion”’. Zeffirelli describes it as an ‘Easter offering’. The ingredients include ricotta cheese, pistachios, almonds, candied fruit and candyfloss. It appears the finished dessert should look like a bird’s nest. In 1977, Burgess collaborated with Zeffirelli on the television mini-series Jesus of Nazareth, for which Burgess wrote the screenplay. Around the same time, he also worked on his novel about Jesus, Man of Nazareth, which was eventually published in English in 1979. The production of Jesus of Nazareth was spearheaded by producer Sir Lew Grade. He was fresh from the success of Moses the Lawgiver (1974), starring Burt Lancaster and thought that the next logical step was to produce a life of Jesus. The Moses television series was also written by Burgess, and forms part of his informal Biblical trilogy with Jesus of Nazareth and A.D. Anno Domini (1985). 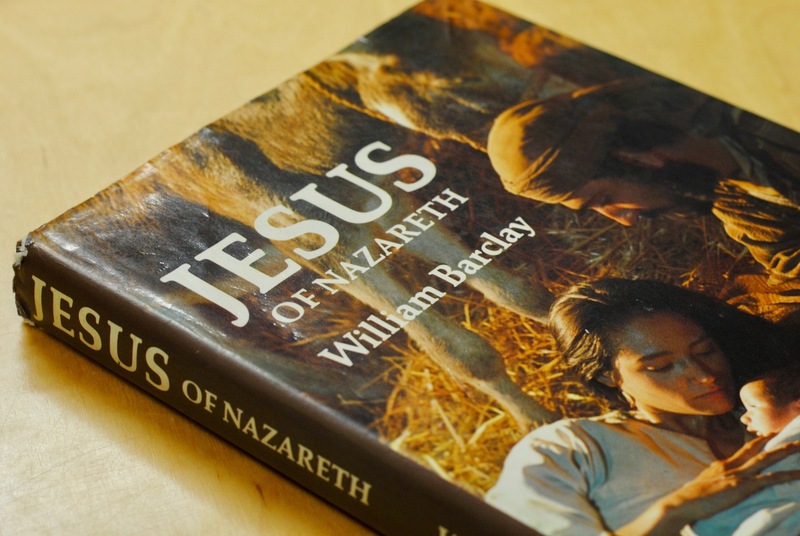 In 1979, Burgess also wrote a novel about Jesus titled Man of Nazareth. Burgess began work on the script, but faced problems almost immediately, not least from his own Italian wife: ‘Liana alone was not happy about my getting down to it. I was up to my neck in show business, and show business had never done me any good. She threatened divorce (not peace but a sword)’. The series, starring Robert Powell as Jesus and Anne Bancroft as Mary Magdalene, began production in Tunisia and Morocco. It was partly financed by the American automobile company General Motors, and produced by Vincenzo Labella, who also produced Moses the Lawgiver, and would go on to attempt to film Beard’s Roman Women with Sean Connery in the lead. 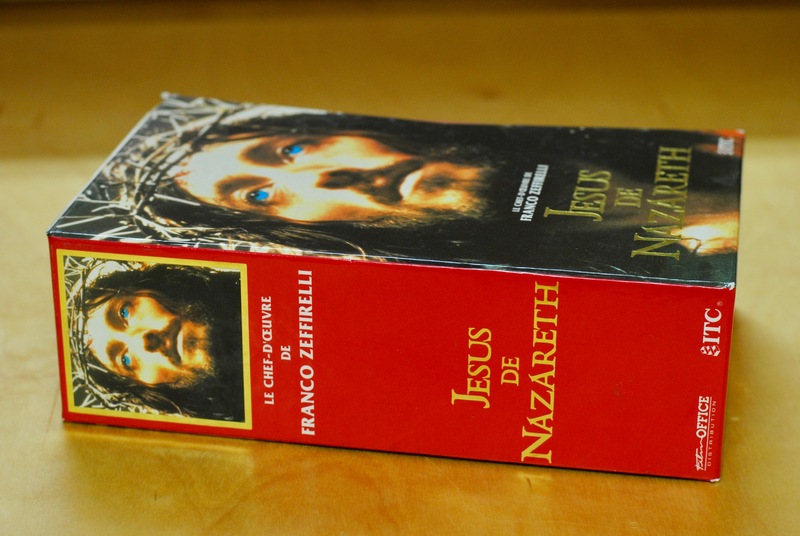 Burgess’s novel was not the only work of fiction to be adapted from the script of Jesus of Nazareth. William Barclay, a Scottish theologian, wrote a more conventional novelisation of the mini-series, which was published, in a lavishly illustrated edition, in 1977. Burgess’s novel, on the other hand is an evolution from the script, both stylistically and narratively. The story is told by the sceptic Azor, who is unconvinced by Christ’s miracles, and Burgess uses fragments of an invented language based on Hebrew. His intention was to write a fictional ‘undiscovered’ gospel which sheds new light on Christ’s life. Jesus of Nazareth is available on DVD, Blu Ray and digital download.